Dominic Solanke could cost the Reds up to €11 million. LIVERPOOL HAVE COMPLETED the signing of England’s Under-20 World Cup star Dominic Solanke. The 19-year-old has finalised his move to Anfield after leaving Chelsea at the end of his contract. Solanke, who initially agreed to join Liverpool in May, could reportedly cost the Reds up to €11 million in compensation because he is under the age of 24. “It feels amazing and everyone has made me feel welcome already,” he told the club’s official website. 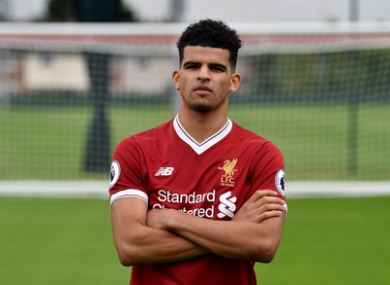 Solanke was named the player of the tournament after scoring four goals to help England U20s to their world title triumph in South Korea last month. A product of the Chelsea youth system, he made just one appearance for the senior side in a Champions League group game against Maribor in 2014. Email “Liverpool complete signing of England U20 star from Chelsea ”. Feedback on “Liverpool complete signing of England U20 star from Chelsea ”.